Striga hermonthica. Image credit: United States Department of Agriculture: Agricultural Research Service (on wikimedia commons). 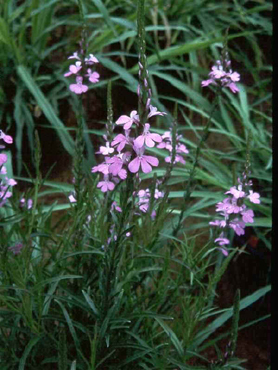 This month’s organism is Striga hermonthica, commonly known as purple witchweed. It is a good example of how looks can be deceiving. From above ground S. hermonthica looks fairly harmless with dainty purple flowers. However, Striga hermonthica belongs to a genus (Striga) of parasitic plants occurring naturally in Africa, Asia and Australia. S. hermonthica hosts include the economically important crops sorghum and rice. Infection with Striga species can cause severe disease symptoms including stunting, wilting and bleaching of leaves. Striga infestations are an especially big problem in Africa, causing an estimated 1 billion USD worth of damage to crops each year (1). 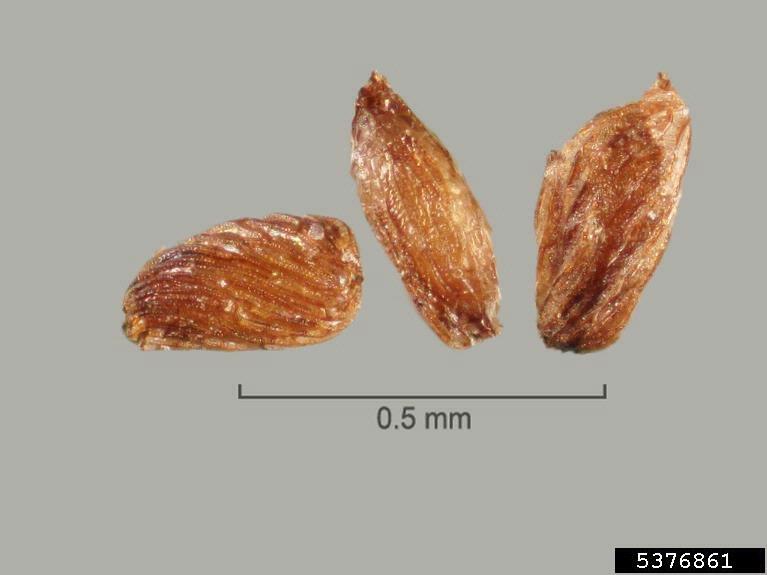 S. hermonthica seeds are tiny! Image credit: Julia Scher, USDA APHIS PPQ, Bugwood.org. Forming a connection to a host plant is critical for a Striga seedling as the endosperm (seed food store) can only support growth for 3-7 days. Once the connection is formed the Striga seedling can “steal” nutrients from the host. Although Striga species are capable of producing their own sugars by photosynthesis they can also acquire them from the host. Robbed of much of their nutrients and sugars it is not surprising that the poor host plants become diseased! Control of Striga infestations is difficult because so much of the plants life cycle is below ground. Also, the long dormancy period of seeds makes total eradication very difficult. Commonly used methods include: hand weeding, chemical control or intercropping with “trap” species (plants that trigger Striga germination but Striga can’t infect so the seedlings die). Another method is so called ‘suicide germination’ where ethylene is pumped into the soil before crop sowing to induce the germination of the Striga seeds in the absence of the host. Breeding of resistant crop varieties is also a way to reduce the impact of this disease but at the moment few of the genes involved in plant parasitic interactions have been identified. Genome sequencing and gene expression approaches are starting to provide some insight so hopefully this will aid plant breeders in the future. That’s very interesting, thank you. Does Striga not have any chlorophyll at all? It does have chlorophyll and does photosynthesize but its not sufficient for it’s needs. They have a low leaf area and often are shaded by the crop plants. I updated this post on 19/09/13 because I realised the link to the second video was incorrect. Sorry! If you read the article before this point I recommend viewing the now correct second video.